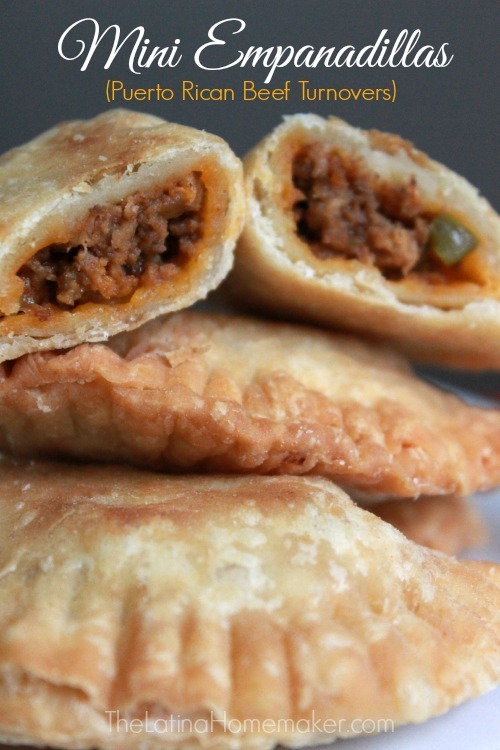 This is an authentic recipe of Puerto Rican Beef Turnovers. They are full of flavor with a flaky outside! Thank you Bob’s Red Mill for sponsoring this post! Besides gathering with family, one of my favorite things during the holiday season is the food. There’s truly nothing better than being able to eat all the thing without having to slave in the kitchen to make it all. When I was growing up one of my family’s favorite recipes was Empanadillas AKA Puerto Rican Beef Turnovers. My aunt owned a small food joint where she only sold Puerto Rican fritters and this slice of fried food heaven was on the menu. Empanadillas are very similar to empanadas except the dough is a bit thinner. Some people also like to add other ingredients to give the dough an orange color. They are typically made much larger than what you’ll find in this recipe, but I wanted to share a “mini” version that would make a perfect appetizer for your holiday gatherings and beyond. Although the traditional recipe calls for a beef filling, you can pretty much use any filling that you like. So if you have a preference in meat, seafood or vegetarian filling, go for it! For this recipe, I used Bob’s Red Mill Organic All-Purpose Flour. 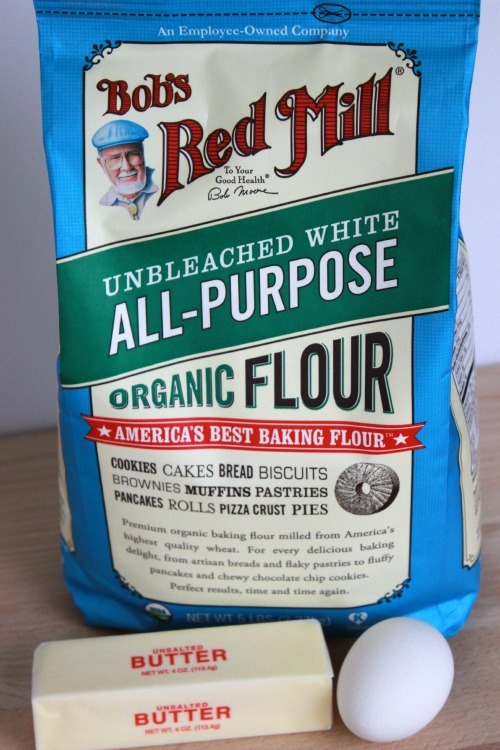 This flour is great because is not enriched with any additives so it produces light, airy baked goods. 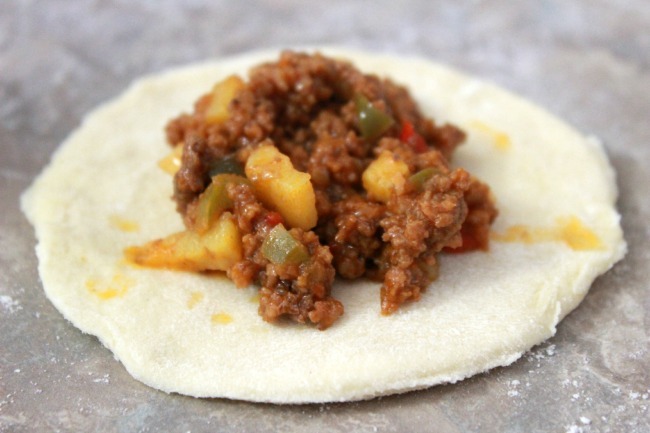 The empanadilla dough was very light and flaky which made this recipe even better. 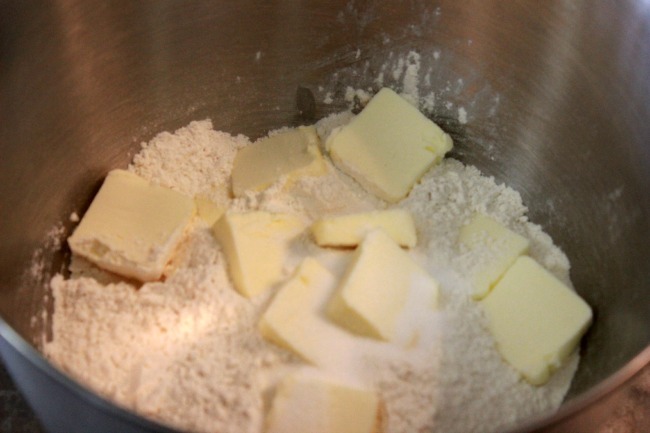 For the dough, mix flour, salt, butter (slice up the stick of butter first) and egg with a food processor or mixer. 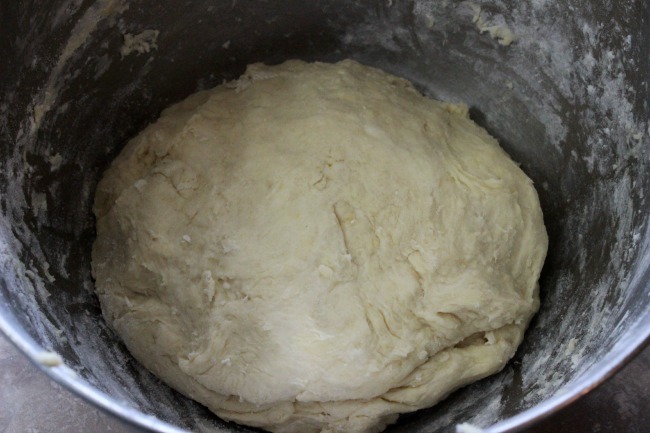 Start adding water slowly until you get a nice stretchy dough consistency. The dough shouldn’t be sticky, if it is, add more flour to the mix. Cover and place in refrigerator for at least 30 minutes. This step is not absolutely necessary, but it does make the dough easier to work with. Season ground beef with Adobo to desired taste, add chopped garlic cloves and brown the meat in a skillet. You may also use salt and pepper instead of Adobo if you prefer. Once meat is cooked add Sofrito, Sazon, tomato sauce, onions, green peppers, red peppers, and potatoes. Let it simmer until potatoes are tender. Take your dough and roll it out with a rolling pin. Make sure to sprinkle flour on the surface, your rolling pin and hands to prevent the dough from sticking. Once you roll the dough out, use a cup or a round cookie cutter to cut circular shapes. Place a spoonful of beef filling on the dough and fold it shut. My favorite method for sealing empanadillas is to use a fork. Simply press on the edge with a fork on both sides and you’re done. You’ll want to fry each side of the empanadilla in hot oil. Simply remove when the empandilla gets a light golden color. You can also bake them, but I prefer to fry my empanadillas since it’s the authentic way to make them. The dough will yield at least 2 1/2 dozen mini empanadillas. You can also make them larger if you prefer and serve them for lunch or with dinner. The filling will be more than sufficient and I actually wound up with some leftover meat that I used to add over my rice. What are some of your favorite family recipes? Feel free to comment and share below! 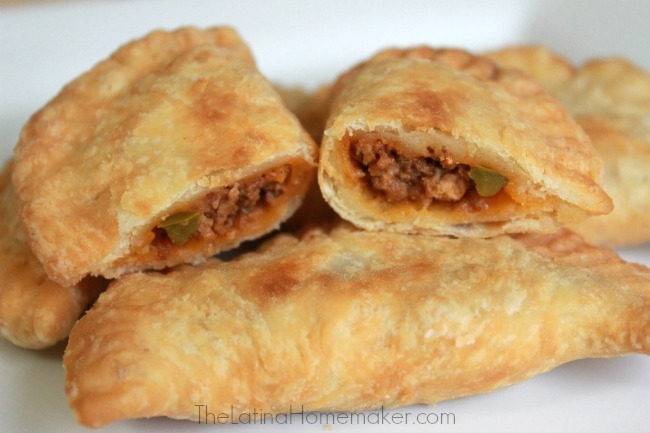 Mini Empanadillas (Puerto Rican Beef Turnovers) – This is an authentic recipe of Puerto Rican Beef Turnovers. They are full of flavor with a flaky outside. Dough - Mix flour, salt, butter (slice up the stick of butter first) and egg with a food processor or mixer. Start adding water slowly until you get a nice stretchy dough consistency. The dough shouldn't be sticky, if it is, add more flour to the mix. Cover and place in refrigerator for at least 30 minutes. This step is not absolutely necessary, but it does make the dough easier to work with. 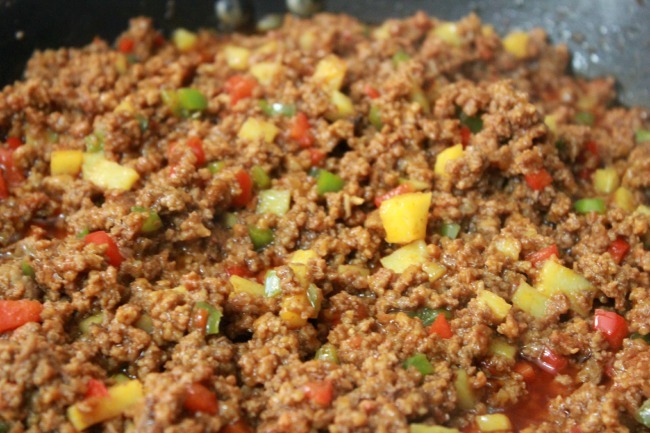 Beef Filling - Season ground beef with Adobo to desired taste, add chopped garlic cloves and brown the meat in a skillet. You may also use salt and pepper instead of Adobo if you prefer. Once meat is cooked add Sofrito, Sazon, tomato sauce, onions, green peppers, red peppers and potatoes. Let it simmer until potatoes are tender. 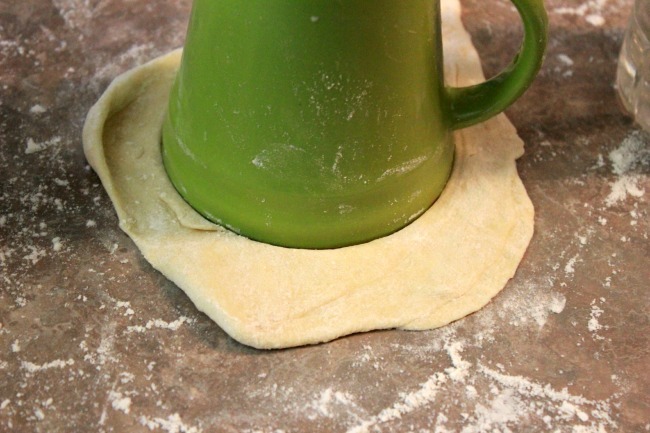 Take your dough and roll it out with a rolling pin. Make sure to sprinkle flour on the surface, your rolling pin and hands to prevent the dough from sticking. Once your roll the dough out, use a cup or a round cookie cutter to cut circular shapes. 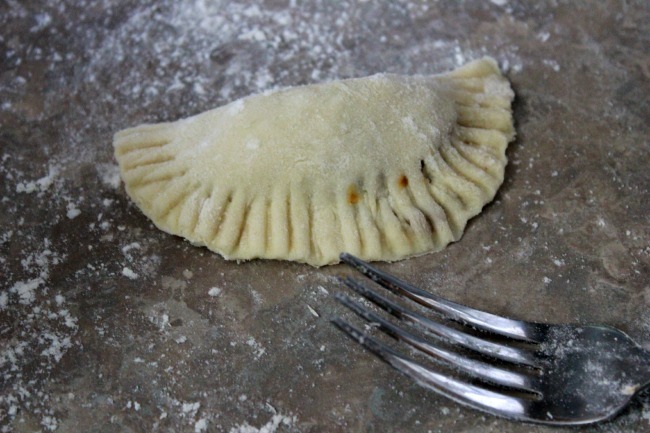 My favorite method for sealing empanadillas is to use a fork. Simply press on the edge with a fork on both sides and you're done. Fry each side of the empanadilla in hot oil. Simply remove when the empandilla gets a light golden color. You can also bake them, but I prefer to fry my empanadillas since it's the authentic way to make them. Yum! I can smell them now. Thanks for sharing. Does it have to be glutin free? I’m entertaining 7 Puerto Rican students this weekend, and using this recipe as one of my dishes; I’m also making rice and beans, roasted pork, Tostinos, and mashed potato balls stuffed with your meat filling. Hope all go’s well lol. Thanks for your recipes. Not at all! Oh, it sounds like a fun (and tasty) gathering. Would love to hear how it all turned out! Yay! How did they turn out Emily? can you bake them instead of frying? Mmmm, que ricas!! thanks for sharing your recipe, I’m sure these homemade empanadillas are a good treat. They are definitely delicious, I can certainly vouch for that. 🙂 Thanks for stopping by Alejandra! Yum! I’m making these tonight but subbing sweet potatoes for the regular and although I like them fried much more my thighs suggest that I bake them. Thanks for the recipe! Yum!! Do you think these can be frozen before frying and fried straight from the freezer? I’ve been wanting to make my own and these remind me of home!! YUM!!!! I am a puerto rican girl and this is almost the exact recipe I use. It is very authentic and delicious. This recipe looks perfect, Jesenia! Thanks so much. I had an empanadilla de carne at the Plaza del Mercado in San Juan and fell in love. Can’t wait to try this out. These bad babies look amazing! I’m not a stranger in the kitchen but when making a new recipe, I like to be sure I have the right stuff. Sofrito, never used it before. Would that be the one by Goya? And I guess the same goes for the Sazon and Adobo. Or would anything with that name do? And can you please specify what type of pepper? Bell pepper? Chili pepper? Thanks a bunch! Thank you for the quick reply! Can’t wait to make these. Sure does! Love the color achiote gives my food. Thank you! Great recipe! Empanadas/empanadillas are one of my favorite Latino foods 🙂 I may be using this recipe for a live cooking demonstration at school that’s timed. In the event that I don’t have enough time to make dough in advance, are there any store-bought doughs that would work, too? What a great recipe! The filling was SO good! The dough was so flaky! My family really enjoyed these; we were eating them hot out of the fryer with crema & salsa! Keeping this recipe to make them with my mom next. Thank you for sharing your recipe with us. Do you deep fry or pan fry? Hi Leann! We pan fry them, but I’m sure they could be deep fried as well.